When people think or talk about Nepal one thing that usually comes to mind is Himalayas, which is reason enough to check out this diverse country, but it’s got a ton of other great things to do too, such as the rarely mentioned safaris you can embark on in the lowlands of the south. Nepal is a beautiful country with many different things to see, do and experience, and in truth, an entire month here alone leaves you having only just scratched the surface, depending on what you want to do. Nepal is accessible by plane into the International Airport in Kathmandu, or by one of the southern land borders coming from India. Depending on your travel plans and your nationality, it can be useful to get a longer multi-entry visa for India and spend a few weeks – a month in Nepal in between visits to India if you’re combining the two – this primarily being due to the potentially high fees of Indian visas depending on your nationality. It can work out cheaper to do it this way, so it’s worth looking into. Depending what you want to do while you’re in Nepal, there are a number of ways you can approach this country. 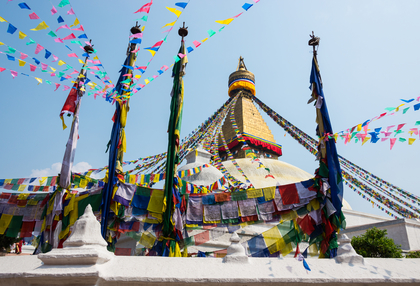 Starting in Kathmandu is always the best bet as it introduces you to things like the food, the culture, the people and the general way of life. The surrounding Kathmandu valley is awash with fantastic trails for hiking and walking. Unfortunately some of the ancient temples and structures were either destroyed or damaged in the 2015 earthquake, but there are still many opportunities to have a look around these ancient sites, especially as repairs were started very quickly and are well underway, if not finished. One thing you can look into while in Nepal – either Kathmandu or further afield in places such as Pokhara – are Thangka painting courses, led by professional painters allows you to develop the skills and technique required to paint your own. Thangkas are paintings in Buddhism – the national religion of Nepal – depicting various deities, scenes or mandalas that are usually colourful and respected in the religion. The city of Pokhara, west of Kathmandu is situated on a stunning, crystal clear lake and surrounded by mountains and hills. This isn’t much of a place to go looking for a party, although you can find one if you are interested at some of the clubs.It’s instead more of a relaxed location for those who are looking to have a chilled out beer with local travellers (or locals!) and those who are looking to possibly head up the Annapurna Circuit. This circuit is a lengthy walk through the Himalaya mountain range along the route that is actually called the Annapurna Circuit. This trek can be done either solo or with a guide, and can be done either in pieces, as in you head to only one specific location, turn around and go back the way you came, or you can do the entire route which takes anywhere from two weeks to a full month, depending on how much distance you cover in a day. Teahouses, which double as guesthouses dot the route, sometimes seemingly every ten or fifteen minutes, which is useful if you find you can only cover a mile a day due to the altitude. Either way – the views along this trek are stunning, and it’s well worth doing even a portion of it, dependant on ability. For the more adventurous – and those who are willing to fork out the money, the Everest Base Camp trek is a possibility, with many groups often doing the three week round trip trek for charity. In many cases a trek to Everest Base Camp can be arranged in Kathmandu. Nepal is home to numerous fantastic home stays and guesthouses, many very low in price and has some of the most delicious food available for practically pennies. Nepal being the cheapest country in the world in which to reside is also possibly the cheapest in the world to travel in (assuming you don’t do Everest, which can run you thousands). Regardless of where you find yourself throughout this beautiful, mountainous country one thing is for certain – you will be left with an impression of hospitality and a welcoming nature that will keep you wanting to return.